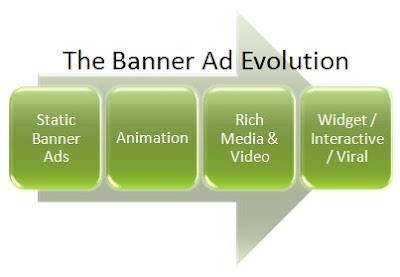 As the convergence of technology advances, we see the evolution of banner advertisement . . . how they are created, delivered and measured. Just as your office printer has also become a scanner, fax and copy machine so has the banner ad become a dynamic interactive video playing and fundraising application. The real question is, "Are your charity's banner advertisements evolving as well?" IP Address Targeting is rapidly becoming a proven method for raising money. Especially, in conjunction with other fundraising efforts, such as direct mail, DRTV and email. Here are but a few banner ad formats to consider for your next campaign. In-Page Banner Ads; are designed in a fixed size (rectangles, skyscrapers or leaderboards) for a fixed placement on a specific Web page. These ads may be static, animated or interactive. Expanding Banner Ads; they "expand" on viewer interaction to provide more information about your nonprofit's work, a special promotional offer, streaming video content, or whatever other content you can create. Pre Expanding Banner Ads; The viewer first sees the ad in its 'expanded' state, then it retracts automatically to its standard size. Tabbed Expanding Banner Ads; allows your charity to organize and present a wide range of relevant information into a series of easy to navigate panels. Each panel can feature video, dynamic data, and other content that complements your organization's message. Free-Form Expanding Banner Ads; can feature multiple floating elements placed anywhere on the page that expand like an expanding ad. Because free-form expanding ads only expand when viewers interact with them, viewers have more control over their experience than with floating ads. Push Down Banner Ads; are expanding ads that "pushes down" a Web site's content rather than covering up the content of a specific page when the ad expands. Floating Banner Ads; they appear and move on a layer above a specific Web page content and remain for a specified period of time and then disappear. Floating banner ads come in limitless sizes and shapes. Floating with in-page Banner Ads; is when the floating ad is finished playing, it leaves behind a smaller floating ad. Viewers can replay the ad, interact or click-through, even after the initial ad has played. Locked Floating Banner Ads; lock your advertisement into place on a specific Web page and will not move as the viewer scrolls through content. This helps to keep your charity's message visible throughout the entire viewing of a Web page. Cursor Chase Banner Ads; literally chase after the viewer's cursor as it glides across the screen. These ads leap from a fixed ad and follow the viewer's cursor arrow for a pre-set duration, and can be disabled by the viewer anytime. Peel-down Banner Ads; they reveal a glimpse of your nonprofit's advertisement in the corner of a specific Web page. When the viewer interacts, the rest of the banner ad peels down to unveil your complete message. Video is the future of nonprofit fundraising online. Your organization must create compelling integrated video campaigns that position you as well as move people to take action to join your cause. There are mulitple ways to present video content within Banner Ads. 1. Auto Play, as the viewer connects to a specific Web site, the video automatically plays after the page has downloaded, immediately grabbing the viewer's attention. The video can then seamlessly expand and turn on sound when the viewer interacts. This type of video implementation is ideally suited for enhancing expanding ads. 2. Fullscreen Experience, take your charity's video banner ad to its ultimate potential with full screen viewing. The fullscreen experience allows the viewer to access your video in full screen mode (like a DVD) from a standard ad unit without any special browser plugins or the latest version of Flash. 3. Interactive Video, drive video interaction by letting viewers to click on multiple elements throughout a video. On a click, additional brand messages or interactive options can appear within your banner ad unit or a custom landing page can be opened. These video are a great way to convert passive viewing into engagement. 4. Teaser Video, is a great way for charities to test their way into this media because of its cost effective short format. Many teaser video ads are in-page applications that auto play for about 10 seconds. Widget Banner Ads; can help your organization reach its revenue goals through FanFundraising™ efforts by extending your market reach, which makes it possible to convert any existing or new ads into a widget ad that can be shared virally across social networks and blogs.